On the one hand, the Mercedes-AMG GT 4 Door Coupe is one of the most dishonest cars of a generation. On the other hand, it has monoblock wheels. Monoblock wheels. I love this car. It is the best. Shout out to style icon and friend of Jalopnik Daniel Golson for pointing this out today because this is what I needed, both for my life and for my important appreciation of big-power Benzes. 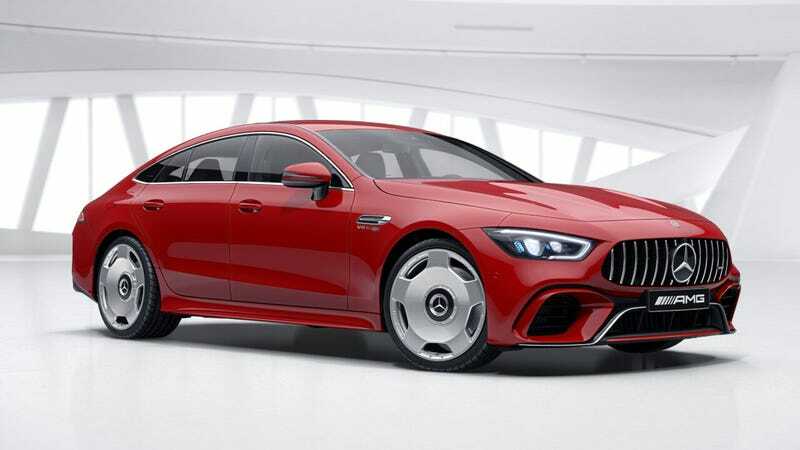 The problem with the AMG GT 4 Door Coupe is, of course, that it’s not actually a four-door version of the AMG GT, but actually just another fastback not-a-coupe version of the E Class, making it not only redundant to the E Class but also to the CLS, which is a fastback not-a-coupe version of that car. I should think this car is lame. And that’s mainly down to, well, if you’re going to go for it, go for it. If AMG is going to make all kinds of pointless niche cars, it might as well make pointless duplicates of them, and it might as well have fun with them if it can. As such, these 21-inch “AMG Schmiederäder im 5-Loch-Design,” as the German AMG configurator puts it. In English, that’s AMG forged wheels in five-hole design, if you’re curious. I would be tempted to get them in black, like the hole that appeared out of the ether into which I cast all of my money buying this car, but I think, ultimately, I would want them in the reflective metal. I would want to walk away from this car and see myself reflected in them like a funhouse mirror. It would not be me. It would be AMG Me living in those wheels, a different person, a person who lived for speed and performance, who would tell people at parties “I live for speed and performance,” and would get a tattoo of, like, a lion, but it’s, like, a spirit lion. It’s not a lion. It’s a spirit lion. I have to go drive my AMG GT 4 Door. Bye.